Help!! I was introduced to The Explorer Academy in January and went for a presentation at Gaborone Sun Hotel where I paid a membership fee of P395 and received various brochures, booklets and a DVD. My problem is that within a month of joining I realized that I could not afford the monthly contributions of P395. On several occasions I visited their office in Gaborone West and could never find anyone who could take my request to withdraw. The person who originally invited me to join has apparently relocated to Lesotho. In April, I finally met one of the team who advised me to write a withdrawal letter which I instantly wrote at the office, to be sent to head office in South Africa. 2-3 weeks later I received a call from someone in SA acknowledging receipt of my withdrawal letter but advising me to take up a cheaper option of P100 per month but I still insisted that it was impossible. In our conversation she read out a text from some contract which I do not recall signing. She stated that I could not withdraw within a year, and that legal action would be taken against me if I stopped paying. However I never received a copy of the contract, even to this day. At the end of our talk she threatened to take legal action for breach of a contract which I don’t believe I signed. In May they made an appointment for me to meet their CEO at the Gaborone Sun. I went to meet her but because of some delays I couldn’t see her properly. I finally met the CEO later but all they came up with was an option of me joining as a partner with TEA so I can get my some exposure in the TEA magazines all over Southern Africa. Since then I’ve sent numerous emails to TEA marketing asking to withdraw but to date nothing has been done yet deductions still continue from my bank account. Their local office appears now to be closed for more than 2 months and nobody seems to have a clue of what is going on! What do you think I can do? Firstly you can tell all your friends that you’ve learned a valuable lesson. The Explorer Academy is yet another of those ridiculous self-improvement, motivational, pyramid-structured selling schemes that abound at the moment. The only people who “improve” themselves from these silly schemes are the founders who laugh all the way to the bank. We looked at the material they gave you and it shows all the warning signs. Here’s the last Consumer Watchdog lesson for the year. Always be slightly suspicious of any company that offers “lifestyle benefits”. Be moderately suspicious of companies that offer “coaching”, “personal achievement” and “personal growth”. Be VERY suspicious of companies that offer “passive income”. Be hugely suspicious of anyone who offers you the “opportunity” to make lots of money by recruiting other people beneath you and then encouraging them to recruit others lower down. If a company mentions all of these things at the same time (like The Explorer Academy does), then run as fast as your legs can carry you because they going to try and take lots of money away from you. The Explorer Academy does all of these things and then a lot more. We’ve seen some of their motivational hogwash and it’s really very poor. Their booklet on “Attitude” is laughably. It is almost all copied, without attribution, from various web sites so they are plagiarists as well as nonsense-peddlers. Then there is the pyramid element to their business model. In their literature they even have the cheek to have a diagram that displays their pyramid structure. It shows how if each victim recruits four others they can earn a lot of money. How much, you might ask. In fact not very much at all. If you recruit 4 people and each of them recruits 4 more and this goes on for 6 “generations” you will earn a total of R56,820. But that’s only after a whopping total of 4,096 victims have signed up for this silliness. Where are you going to find over 4,000 people gullible enough to fall for it? And, to cap it all the organisers call this “a millionaire’s income”! In your situation I think you should look at whatever paperwork they gave you when you signed. If, as you say, they didn’t give you a copy of the contract they expect you to abide by, then THEY have a problem. They cannot expect you to honour that agreement if you don’t know what you signed up to. Demand from them a copy of your original documents. Give them 14 days to deliver it to you or you’ll go to the Police and lay a charge of cheating against them. We have tried contacting The Explorer Academy by email and by phone but nobody has responded yet. If they do we’ll post it to our website so you can all see what they say for themselves. And finally. Please, all readers of The Voice and their families, friends and neighbours, have a fantastic Christmas break. Most of all have a peaceful, prosperous and scam-free New Year. Let’s try to spend an entire year without falling victim to scammers, store credit abuse and pyramid schemes! Do NOT give Prokard your bank details! A sales person called me and identied her company as Protea Hotels (Prokard Midrand). She was selling a product. I asked for more clarity to be emailed. She asked a couple of questions including how do I celebrate my birthday, where, when is it? She asked if she can send information via my address, asked for the addrres which I gave. She proceeded to ask about my banking details which I questioned initially because I was not buying anything that I did not quite understand. I was foolish enough to give the details anyway, I did not authorise the transaction though. Instead of getting more information as per my request my Credit Card account was debited (BWP 1000) and I never got the information I needed nor the product. Made follow up why my account was debited, the response was very casual. Wrote an email with no response. It isn't the first time we've had a complaint about Prokard telemarketers. We reported on exactly the same situation back in July this year. We've emailed Prokard but given that it's nearly Christmas and that they didn't seem to give a damn last time I'm not expecting much of a response. If there's a festive miracle we'll let you know. Mmegi story - "Credit furniture stores flout hire-purchase law"
A story in Mmegi a couple of weeks ago on store credit, quoting Consumer Watchdog and naming those stores who aren't currently obeying the law. Why do electricians swear so much? This is one of the great philosophical questions of the day, I’m sure you’ll agree. It’s up there with the meaning of life (“Ice cream, give me ice cream!”), what happens when you die (big family party, with ice cream) and why combi drivers are so keen to find out as soon as possible whether there’s ice cream in the afterlife (who wants an afterlife without ice cream?). Electricians swear so much is because they’re afraid. Deeply terrified. They’re profoundly afraid of killing either their customers or themselves. Unlike a plumber, a carpenter or a builder the material that an electrician deals with is a homicidal maniac, desperate to kill anyone nearby. Electricity is desperate to reach the ground as easily as possible and if you happen to be the easiest way to get there then you’re fried. Last week we had a new air-conditioner installed. We used a perfectly respectable company to install it, a company we had used before and who we thought had done a fairly good job. By coincidence the next day we had our trusted electrician in to attend to something else. While he was here, we asked, could he please just check that the aircon was installed properly? No problem, he said. That’s when the swearing started. I can’t tell you exactly what he said, Mmegi would only replace the words with ****, ****ed and ****ing. You Mmegi readers are imaginative, intelligent people, I’m sure you can imagine what he said. What he’d found was enough to scare him. The aircon had been wired into the back of a wall socket, with no serious surge protection. What’s more, the cable that ran from the socket to the aircon was too small to take the power the aircon needed. There was, he said, a real risk that if the compressor in the aircon failed the socket could blow, damaging any other appliances coming from that socket. Given that one device that is often plugged into that socket is my precious Apple Macbook I was an unhappy man. That’s when I started swearing as well. Then he told us that the inadequate cable was a serious fire risk. Then we all started swearing. Of course we got the electrician to replace the offending cables, connect the aircon directly to the distribution board, install proper surge protection and make it all safe. We then deducted his costs from the bill the aircon installation company wanted us to pay. If this had just been a poor plumbing job that leaked or a poor paint job that looked untidy I would just have been irritated. But this was electricity. This was potentially lethal. Yes, you’ve guessed it, Consumer Watchdog is launching another rant about standards and the lack of enforcement. Standards are great. Standards are really useful. You’ll have seen announcements in the papers from the Bureau of Standards announcing public consultation on the new standards for an endless range of things such as plastic pipes, manhole covers and even, most recently, onions. They’re all great but I don’t think they matter as much as standards that can protect our lives. The tragedy, the infuriating thing is that we have more enforcement of trivial standards than we do of the ones that matter. If you buy an onion that doesn’t meet BOBS standards you’ll live. If you use non-BOBS approved plastic tubes then you’ll probably survive. If, however, you have an aircon installed by an amateur you and your loved ones could end up on the floor smoking. I’m the last person to suggest that we need another level of bureaucracy and paperwork in our daily lives but I think it would be good if only trained, qualified and experienced electricians were permitted to do electrical work. I think it would be good if third-rate electricians could be stopped from risking our lives if they show themselves to be incompetent. We do it for doctors, accountants and lawyers so wouldn’t be good if there were penalties for incompetent amateurs who run the risk of frying their customers? One irony that occurred to me is that electricians that take the time and effort to get trained can make serious money. The only genuinely self-made multi-millionaire I’ve ever met was an electrician. He started with nothing in life and ended up living in a massive house in a very select area of London, a house he bought for cash. The secret of his success? Standards. And exceptionally high prices of course. However, despite his high prices nobody complained because everything he did worked perfectly. Customers never needed to call him out again a week later to fix something he’d done incompletely or incorrectly. The good news is that there are competent professionals out there. There are excellent electricians, plumbers and builders out there. The tragedy is that, as a nation, we don’t insist that ALL of the people should be as good as possible. We excuse incompetence, we permit mediocrity and we scorn excellence. If we, as consumers, want excellent service we need to insist that standards are created and enforced. When they’re not, we should do what electricians do. We need to start swearing more. My friend the electrician. He knows who he is and I’m not telling you. He’s mine. Sylvia Moji at Broadhurst Executive for the excellent service. Stuart and Lebo for their outstanding contributions to the recent President’s Concert. In January 2009 I bought a bed from Supreme at BBS on credit over 12 months, paying P750 per month. I paid P3,500 and the balance remaining was P5,000. I didn't manage to pay for 5 months and they told me they would come and pick the bed and sell it. I agreed and they took the bed in August. In November I found out they took me to ITC and I'm still expected to pay the balance of P5,000. I spoke to the manager and she said the bed was sold for P600 because I had used it. So I was wondering why they didn't take me to ITC without taking the bed am I supposed to pay the balance of the bed that I am not using? I‘m sorry but you did still owe them P5,000 when they reclaimed the bed. The bed is now second-hand and there’s no way anyone would have paid the full balance of P5,000 for it. Remember that the actual value of the bed was nowhere near the P8,500 you were paying for it. The original cash price was probably only half that. Take off the store’s profit and then the depreciation after nearly a year’s use and it’s likely it was only worth perhaps P1,000 at most when the store took it from you. It’s therefore not surprising that they only raised P600 for it when they sold it. You still owe them the difference between the outstanding credit balance, minus the money they sold it for and probably PLUS any costs they incurred by reclaiming the bed from you. However, the numbers you’ve given us don’t quite add up correctly so it might be worth double-checking them before you settle. It’s also worth looking at your original credit agreement to see what they were entitled to do and to make you pay for. This is an example of why we are so opposed to buying furniture on credit. You pay a vast sum for something that’s simply not worth the credit price. If you then have problems repaying you are still required to pay off the total price you agreed to. If you then have the item repossessed you could actually ADD to the amount you owe and you end up with nothing to sleep on. It’s unbelievably important to read a credit agreement BEFORE you sign it. Sit down, read it carefully and think about the worst that could happen during the term of the agreement. Can you really take the risk? Unfortunately it’s very unlikely that you can avoid paying this amount. However, if you send us the details we’ll approach Supreme and see if they can be flexible. It’s nearly Christmas so perhaps they’ll be feeling some good will? One last point. Someone got your bed for P600. See how cheap second hand items can be? Everyone should consider second-hand items, they’re a very good way of getting perfectly good things at incredible prices. I went to the store last week and I was shown a report saying the laptop had been subjected to physical damage and there was therefore no warranty. They gave me no explanation to support the report which shows it was done the date I went there on the 2nd December 2009. The guy got angry with me and took the report and refused to give it to me it. He then said that I have tarnished the image of his company and there is no way he can help me because the story is already in the media. This is very suspicious, don’t you think? They refused to give the consumer a copy of the report that suggested he had damaged the laptop? Why would they do that? Are they trying to hide something from him? It’s simply not good enough. If the customer is going to be liable for the repair costs he has a right to know why, don’t you think? It’s only fair and reasonable. So what do you think about us tarnishing the image of the company in question? I think that would be difficult considering that we didn’t name them, don’t you? We phoned the company, which I’m now happy to name as Micro-IT, and asked them about the situation. Unfortunately their immediate response was that Consumer Watchdog ALWAYS takes the customer’s side of any argument (not true, see the story above) and they weren’t willing to help us. A little later we heard from the consumer again. It seems that someone from Micro-IT phoned the consumer’s employer and threatened them because the laptop had actually been paid for by the employer. Apparently Micro-IT are planning to sue the employer as well as Consumer Watchdog for damaging their reputation, but I’m not sure this is possible. This is the same Micro-IT that was prosecuted for selling pirated software in February this year. Can we tarnish that sort of reputation? The Bizz Awards doesn't exist? A curious thing. The Bizz Awards were meant to be having their 2009 Awards ceremony at the Hilton Americas in Houston, Texas on the 2nd December. I phoned the hotel and they were confused. They've never heard of the Bizz Awards or the World Confederation of Businesses. Can it be that the Bizz Awards is a sham as well as a scam? What are the warning signs that consumers should look out for if they want to protect themselves? What are the clues that something is perhaps not what it seems? What signals should make you run in the opposite direction? Well, you can start with pseudoscience. Whenever you encounter a pseudoscientific claim you know you should be running away screaming at the top of your voice. So what, you may ask, is pseudoscience? My dictionary defines it as “a collection of beliefs or practices mistakenly regarded as being based on scientific method”. Note the key bit: “mistakenly regarded”. “Pseudo” comes from the Greek word for “false”. A simpler definition might just be “fake science”. Pseudoscience is something pretending to be scientific. The commonest approach is just to jumble up some scientific-sounding words into a phrase that sounds impressive but, in fact, is just mumbo-jumbo. Want an example? Well, it sounds scientific, doesn’t it? Yes, it does, but that doesn’t mean it IS scientific. In fact as any teenager studying science at school will tell you, it’s just a jumble of fancy words with absolutely no meaning. It’s pseudoscience. That’s a warning sign you should always look out for, particularly as it’s an approach often used to sell so-called health products. A year ago we saw a product calling itself BodyTalk (see here and here) which, it’s ignorant proponents claimed, “utilises state-of-the-art energy medicine to optimise the body’s internal communications”. More pseudoscientific hogwash. What else should you look out for? What about one so obvious that it often escapes normal, reasonable, intelligent people? Money up front. It’s the essence of the 419-style “Nigerian” scam but you also find it in a range of other scams and deceptions. Like skirt length and the style of jeans, scams come in fashions. The current fashion is for fake travel and employment schemes. In the last year we’ve seen several that offer amazing job opportunities in far-flung places that will earn you a small fortune. All you need to do is give them all your personal details and some cash. It can be as little as P375 for an “administration fee” and lead up to as much as P20,000 for the entire process but the one thing you’re guaranteed not to get is a job. A couple of weeks ago we were alerted to a company calling itself “Royal World Adventure” that was demanding over P10,000 to get a job on a cruise liner. Just last week we heard of another possible travel scam offering people jobs in Ireland. Again there’s money needed up front and no real prospect of anything from it. We’ve also been approached over the last few weeks by a number of readers about Stock Market Direct. This company, whose name makes it sound like a stock broker, in fact sells “educational software” that they suggest allows you to trade on the Johannesburg Stock Exchange, the JSE. They do presentations at which they extol the virtues of online trading and suggesting that you can make small fortunes very quickly. However it’s not as simple as that. You may have seen notices in most newspapers in the last week or two from the Botswana Stock Exchange warning people about the company. They point out that they seem not to be registered stockbrokers in Johannesburg and that in any event JSE rules require you to operate through a broker and not to trade directly yourself. They also point out, very sensibly, that nobody can promise massive returns on any stock exchange. Yes of course some people make a lot of money but just as many don’t. Investing in stocks and shares is a bit like betting on a horse. If you’re not an expert or very well-informed you can easily lose the lot. That’s very sensible I think. Obviously I’m not going to comment on the motives, character and ethics of Stock Market Direct but yes, we all SHOULD exercise caution when giving them lots of money to get their software. All of these clues have one underlying message. You really shouldn’t believe the unbelievable. As Carl Sagan once said, “incredible claims require incredible evidence”. Claims that you can make a fortune selling miraculous sanitary towels, solve all your health problems with ludicrous technology, get a wonderful job on a cruise liner or make an instant fortune by betting shares are all “incredible claims”. Before you part with your hard-earned cash you should demand some incredible evidence. The Botswana Stock Exchange for making their regulatory voice heard. I have been contacted by a company called Stock Market Direct and invited to one of their presentations one evening. They say that people have made 40% profits from their investments very quickly. Do you think I should go? There’s no harm in going. However, there could be harm if you do anything else. Stock Market Direct is a strange creature that I don’t fully understand. It’s name suggests to me that it’s allows you to invest and profit from the stock market directly but that’s not the entire truth. Firstly they have NO connection with OUR stock market, the Botswana Stock Exchange. None at all. They claim instead that they offer connections to the Johannesburg Stock Exchange, the JSE, but it turns out that this might not be a completely full explanation either. “The software … automatically scans the market for you at any given time or in the evening. It will indicate for you out of all the companies listed which ones you should be buying and which you should be selling. I think that constitutes financial advice, don’t you? My understanding is that organisations that offer financial services must be registered with the Non Bank Financial Institutions Regulatory Authority. I wonder whether Stock Market Direct are? We’ll check for you. Then there’s more. Last week the Botswana Stock Exchange placed a “Notice to the Public” in several Botswana newspapers. The notice warned the public about Stock Market Direct. It noted that they are not registered with either the BSE or the Central Securities Depository Company of Botswana, the entity which regulates stockbrokers. They also pointed out that some of what Stock Market Direct says in it’s marketing isn’t strictly true. Investors can’t access the JSE directly but must go through brokers to do so. The BSE also state that to the best of their knowledge “Stock Market Direct is not a stockbroker of the JSE” and is not regulated by the relevant bodies in South Africa. The statement also reminds the public that no person or company can promise returns from the stock market. Consumer Watchdog can only agree with the BSE. I believe that at the moment there are too many questions about Stock Market Direct and we think you should certainly follow the BSE’s advice and “exercise caution and discretion” before going to any of their presentations and certainly before giving them the P15,000 their “software” apparently costs. It might be simpler, cheaper and safer just to stay at home. It’s that time of the year where us consumers do lots of shopping. I am planning to buy some electronic goods this Christmas and wanted your help. I have identified some electronic goods from some stores which I intend to buy very soon. The problem that I have is that I have never dealt with some of them in the past. From your experiences and consumer complaints would you recommend that I buy from them or I should avoid them and stick with what I know? I think you’re very wise to think carefully about where you buy from, particularly as we approach the Christmas holidays. Although I’m not going to tell you the names of stores I think are good (they are perfectly capable of doing that themselves) I do think I can give away the simple tips that I use when selecting which store to buy from. Ask around. Ask your friends, neighbours, colleagues and relatives whicßh stores they like. Ask which companies treated them with respect, had the best prices and, most importantly, which treated them decently if something went wrong. It’s all very well picking the cheapest store but if they provide no after-sales support then I wouldn’t give them my money. Shop around. Of course we all know this but so often we fail to follow this simplest piece of advice. Just do it. It could save you a fortune. A simple tip. Only buy from stores who obey the law. Do NOT, for instance, give your money to any store that doesn’t disclose the full price of an item when they are offering it for sale on credit. Just leave and don’t reward them for breaking the law. Most importantly use your own experience. It’s bizarre but we often hear from consumers who had a terrible experience at a store, managed to sort things out eventually and then go back to the very same store. The lesson is to boycott those stores that treat you badly and to reward the good ones with your on-going support. Finally, make sure you know your rights. Never buy anything without fully understanding what you can do if things go wrong. Following our coverage of the fake awards scheme called "The Bizz Awards" run by the "World Confederation of Businesses" we received an anonymous email offering us inside information. The emails from the anonymous source are in red, my responses are in blue. Yes, I'm still interested. What is your connection or interest in the Bizz Awards? That's very interesting. What else can you tell me? I can tell you a lot, they kick me out of my job because I was trying to tell my boss things must change, I didn't like the way they treat the members and clients, I am left without job. That's very interesting. Tell me more. Where are you from? And then it begins to become even more suspicious. I'm supposed to "give something" to get the infomration... (my emphasis below). from europe, I came to peru to work for them, I wish to tell you more but I would like to know if you can give something to help me to spend a nice a christmas because thanks to those people I am left with nearly nothing. Perhaps you can give me a little more detail first? I was in charge to get in touch with the clients for a couple of months, I have documents in my hands, I know a lot about what is going on. the evaluation comity never was, it is just a business. I think we all knew that the so-called evaluation mechanism is a nonsense but it's interesting to hear that confirmed. Another request for money for the information (my emphasis below). I have a lof of documents and I can tell you much more about but I really am in a difficult financial situation and I would like to know what you can do to help me to spend a better christmas that the bizz awards offered me. I have originals texts where the bizz awards people explain us very clearly how to lie and manipulate the companies managers to get money out of them, I have a lot of informations. everything is fake, just to get money out of the customers. Is it possible you can send me some of this? Another request for reward (my emphasis). YES I CAN, BUT FIRST I WOULD LIKE YOU TO MAKE ME AN OFFER, WHAT YOU CAN OFFER ME IN EXCHANGE, I LIKE TO HELP YOU BUT I ALSO HAVE MY NEEDS AND AS TOLD YOU SINCE I LOST MY JOB BECAUSE I WAS JUST TRYING TO DEFEND THE CUSTOMERS RIGHTS. I KNOW A LOT ABOUT THE PRACTICE OF THE BIZZ AWARDS, THE WORLD CONFEDERATION OF BUSINESSES AND WHO THEY REALLY ARE. I'm sorry, I can't offer you money for information, it would be totally unethical. Thanks anyway for getting in touch. In my email yesterday I said: "I'm sorry, I can't offer you money for information, it would be totally unethical". Thanks anyway for getting in touch. Well it is your choice, I don't understand, you should also undestand my point of view and see my position, I believe I could give you a lot of information witch will let you to see how much the bizz awards are a rip off they keep on lying to more and more companies and you could have help people and give your blog more credibility i don't know if so many managers rread you but with the informations I will give you your blog will really be on the top, but if you want to miss the best scoop you could have about the bizz awards, I think it is not ethical to leave a victim of the bizz awards without noting I also need my chistmas. it is fear, I also take a risk on telling you the information, I send you as attach document the last orders our manager gave us to manipulate managers to let them signing the contrat to make them members of the bizz awards. it is in spanish but you can translate it, our company is located in lima peru it has never been in houston texas usa. If you can offer a gift of partnership I will tell you more. Attached to the email was a document in Spanish that appears to indicate that the Bizz Awards people manipulate their "customers" and are not entirely truthful about their operations. Unfortunately my Spanish is virtually non-existent and Google does only a moderate job of translating things. However a good friend who speaks Spanish cast some doubt on the document, describing it as "full of spelling mistakes and typos". I thought I could trust you, indeed I think it is fair what I am asking you, I believe that you are not really interested on solving the bizz awards story, I am really sorry about, I might have rung the wrong door, who knows. it is totaly unethical to leave out with nothing somebody who is also victim of the bizz awards and try to help you to understand what is going on, also I didn't ask for money, I asked you what you can give me in exchange, I help you to make your blog world wide famous and to make justice and you just make me a small christmas gift, there is nothing wrong about it, it is fair. I am waiting for your answer be clever bizz awards are winning and we have to do something to stop them they are becoming more and more important and lie to people about what they reallly are, so do you really want to make something to stop tnem and to give your blog its real importance. Don't you think it's unfair to accuse ME of being unethical when it's YOU that is demanding a reward for handing over information? At the moment I wonder whether you are actually FROM the Bizz Awards and trying to trap me into unethical and perhaps illegal conduct. well I don't know what you are talking about, I allready told you I I was working for the bizz awards and I already gave you informations to prove it I don't know what kind of unethical or ilegal conducts you are talking about but I think the bizz awards are the only one to follow an ilegal conduct I am just a person who was been rip off by those people i thought you could be able to help me and that we could be working together to solve the bizz awards but I guess today you have never been interested to solve the bizz awards problem you are just playing a game and nothing else thank you for your help I know what are people like you selfish your blog will never be famous and recognized because you are not strong enough to get along you were just here to play with some people. I will just tell you that : houston bizz awards event do not exist yet no reservation has been made it is just another tricks from them theirs world events are just wind they are selling promesses witch do not exist like the african events. you have to know what you really want. totaly normal to ask for reward for information meanwhile I am left without job i call it solidarity and fairness we have a family i think you don't want to do anything to solve the bizz awards and to help us, you are just having fun and you don't care. I tell you there is no reservation made for the Houston event and they are lying to people. their office is in peru and has never been in Houston you blog up to know has a very little impact they don't care they keep on lying to people I thought we could solve this problem together and give your blog a real impact but we see that you are not really interested on acting. I make a mistake to get in touch with you I thought I could trust you but my friend told me you are just a story teller, you are not strong enough to get on you are just a son of family who doesn't know what to do with his life, you don't really care about the bizz awards and your blog is just a big joke I don't believe I can trust you because you blog will never be able to fight against the bizz awards and we will keep going without you it is a pity. All of this just because I wouldn't pay you for your information? I already gave you some very important information, but you don't seem so interestied on the bizz awards, I was there when you were calling, I read all your mails and i know very well the person you were in touch with, I can give you much more informations about the bizz awards, I didn't ask you to pay me but just to understand my situation and to help me like I help you with a little christmas gift, I think it is fair and honest, I will eat dry bread for christmas for the bizz awards manager guilt, I thought you could understand me. So what exactly do you mean by "a little christmas gift"? Give me a clue? If I was to send you a "a little christmas gift" how would I send it to you? choose the way it is your gift, once you know the gift you want to offer me then we will find a way to let me to have it. thanks. jesus moran sells 3 more contrats and 2 more from his colleagues. they keep on lying to people. they rip off 19 companies from french africa, mali benin ivoiry cost, now there are working especially with middle east, they made one contrat with dubai at the begining of the week. This isn't working for me. Make it clear. What "cost" is there for your information? I have no price, I just wish to spend the nice christmas jesus moran and his calidad de impacto bizz awards denied me, I want you to estimate what is worse a nice christmas, send me and offer me what is worse for you. I will send you a list of african clients later on. I know a lot about them and their way to work, it is a big lie. No. If you have a price, please name it, otherwise let's stop communicating. Finally I get an idea of what he wants. It IS cash and quite a lot of it too! sorry you take it that way, well i already gave you a lot of information and you didnt gave me anything yet, I have no price, I am left with nothing just before christmas I have children, so I am asking for your solidarity, my christmas gift is my information about the bizz awards and you gave a nice christmas, I dream about a nice chritmas, just to make nice gift to my 5 children, my wife, a nice time and a nice gift for me, I dont ask for money, I am not for sale, but I believe as I am left with nothing my family and I have the right to spend a nice chrismas like anybody else, for all those things I would have dream to spend 1000 dollars, but it might be just a dream. I believe you don't take me seriously because you didn't publish anything of what I wrote you in your blog, I doubt you are really interested on solving the bizz awards problem. I hope readers will forgive me for not paying a total stranger US$ 1,000 in return for this information but I DO have some standards. This year marks both the 200th anniversary of the birth of Charles Darwin and the 150th of the publication of his book, On The Origin of Species. This masterpiece of modern, rational and scientific thought forced humanity to reconsider and re-evaluate it’s position in the grand scheme of things. At it’s heart, Darwin’s theory of Natural Selection is remarkably simple. Those members of a species who are better adapted to their environment are the ones most likely to live long enough to pass on their better adapted genes to their offspring. Very gradually, generation by generation, this can bring about a significant changes to a species as a group. As you may have seen various TV programs, books, news items and newspaper articles have commemorated these anniversaries. In one that I saw the day I wrote this, Richard Dawkins, one of the world’s leading evolutionary science communicators explored the parallels that might exist between evolution in biology and the business world. Very often you’ll hear phrases stolen from the world of biology used in business. You’ll hear people talk about “survival of the fittest”, of “dog-eat-dog” and of the “life-cycle” of business. Of course these parallels are true to an extent but, like evolution, they’re not always obvious. Evolution doesn’t always favour the strongest specimens but those that are “fittest”. Not “fit” like a body-builder pumped full of steroids, but “fit” like a jigsaw piece fits. It’s the animal that fits best into it’s environment that is most likely to survive and pass on it’s genes. It’s the same in business. It’s not always the hugest, most macho companies that do best. Sometimes it can be a smaller company, the more agile, flexible and adaptable companies that survive. Often you see companies that become so old-fashioned, so slow and so cumbersome that they are obsolete. Of course one of the other parallels with evolution is that often businesses survive through nothing more than sheer, dumb luck. Right place, right time, right customer and it survives a little longer. However in the long run that’s not a recipe for success. The question of course is how a company can “fit” best into it’s environment and succeed, passing on it’s business genes to it’s child companies. One of the perils of being in a consumer-focussed team is that you learn more about how companies shouldn’t do things than you do about how they should. However I think you can learn a lot about success by studying failure. Forgive me. Here comes a very poor quality analogy. For a few years we’ve been applying evolutionary pressure to furniture stores, trying to persuade them that their survival might depend, ever so slightly, on obeying the law. In particular that they should advertise the total price of the items they offer for sale on credit. Some of the more agile members of the furniture store species reacted rapidly, others more slowly. This week two more companies showed signs of evolving. The insert from Game that you’ll probably find in this newspaper now shows the credit price for all items priced over P1,000. If you want to buy anything below P1,000 Game have said they will “will utilize price matrix cards showing typical repayment terms across a range of purchase prices starting at P300”. I think that’s perfectly good enough. Good for Game. We also met with the new head honcho from Furnmart and HomeCorp. He also has committed these companies to advertising the full credit prices from 1st January next year. So let’s hope that these two, who have successfully reacted to a bit of external pressure, will continue to be adaptable and will fit even better into their environment. That just leaves a few companies like Supreme. Do they really want to go the way of the Bali Tiger, the Thylacine and the Dodo and end up extinct? Another store that might end up with the Dodo is Styles who recently behaved like they don’t want to survive. A consumer contacted us because she’d bought a bed from Styles for over P3,000. Within a month it was creaking and was uneven. After a month of nothing from the store she just took the bed back and demanded a refund. That’s when they showed themselves likely to become a Dodo. After another month the owner finally called and all she got from him was rudeness. That’s when she came to us and we unleashed a predator. Our predatory mammal got in touch with him, outlined his obligations to the consumer and demanded an explanation or she said she’d bite his head off. His excuse was not “fit”. He’d been busy he said, he’d been travelling a lot and he hadn’t even inspected the bed yet. He also told us that another predator had attacked him. His trading licence had apparently expired so he thought this meant he couldn’t give her a refund. Eventually he responded well to our predatory beast and the customer got her refund but this doesn’t show him as a successful member of his species, does it? Little chance of his genes being passed on I suspect. If you want your genes to survive, you’ve got to procreate. You have to find a suitable mate with whom you can share your genes and pass them on to another generation. It’s similar in business. If you want your business to survive, it must survive, profit and procreate. The only way to do this is to allow suitable customers to find you and have them mate with you. Lie back and think of your genes. It’s worth it for their sake. Game Stores for advertising their credit prices clearly and simply. Furnmart and HomeCorp for promising to evolve. I have a problem with Lotus Trading in Francistown. On the 10th September I bought a Nokia N97 phone from them at P1,999. Around the 15th September the touch screen stopped working. On the 23rd September I took the phone back to complain about the defect and I was told the store only changes phones if hey are returned within 3 days after purchase. At the store they kept insisting that the phone was dropped but this is not true. There is no evidence that has been dropped, it has no cracks or even scratches to show it was damaged. The only option I got from the store was to take the phone for repairs for 3 months and for me to pay for the repairs if they are not manufacturer-related. I am very unhappy about this. I still have the phone with me because I thought the option that I was given was ridiculous. This store has failed me, why should I pay such amount only to lose the phone for 3 months while they repair it. What also annoyed me is that they refused to lend me another phone when mine is taken for such a long time. I hope you will help me to fix this? This is very suspicious. Very, VERY suspicious. Let’s begin with the obvious things. A store can’t just decide they’re not going to fix an item they sold you when it goes wrong just because they don’t want to. Section 13 (1) (a) of the Consumer Protection Regulations says that suppliers must sell you things that are of “merchantable quality”. That means that the phone they sold you must be “fit for the purposes for which commodities of that kind are usually purchased”. In simple terms this means that cellphones must be able to make calls. Cellphones with touch screens must have touch screens that work. Simple enough? Nokia cellphones, like phones from all reputable companies, come with a 1-year manufacturers warranty. However, there are situations when that manufacturers warranty doesn’t apply. So-called “grey imports”, where the supplier has bought a lot of phones from Region A of the world but is selling them to consumers in Region B often aren’t covered by the manufacturers warranty. However as a consumer you have a right to be told about this BEFORE you buy the phone. The supplier can’t just tell you there’s no warranty after they’ve sold you the thing and it’s gone wrong. What’s more, the supplier is forbidden, by law, from denying that there’s no warranty unless they explained that to you before you bought the phone and, more importantly, that you “specifically consented” to it. Unless you signed a piece of paper acknowledging that you were happy for there to be no warranty then there IS a warranty. However, I think you should demand a partial refund, not a complete refund or a replacement. Here’s why. Firstly I said a “partial” refund. That’s because you did have use of the phone for a couple of months. Obviously that’s not long enough but it did work for a while. The next issue is that your phone is a fake. It’s not a real Nokia N97. We spoke to the owner of the store and discussed this with him. He admits that it’s a fake Chinese phone that just looks like a Nokia N97. It even says it’s a Nokia N97 but it’s not really. The price also confirms this. A real Nokia N97 will cost you around P7,000, much more than you paid. For readers who don’t know it, the N97 is a top-of-the-range smart-phone with a pullout keyboard, fancy touch screen and a host of amazing features. It’s also hugely expensive. What’s more, the owner says he discussed this with you and that you confirmed in writing that you understood this and that you also confirmed that you understood that there was no warranty. I also don’t think it’s worth repairing this phone. The trouble with cheap fakes is that that’s what they are: cheap fakes. They aren’t going to be as reliable, robust and repairable as the real thing. Whether the store is right or not when they say you damaged it isn’t the issue. Cheap fakes break easily. That’s the real reason you pay all that extra money for the real thing. You pay for reliability and the warranty. I think you should go back to the store and negotiate a partial refund. That’s probably the best you can hope for. There are several lessons consumers can learn from this experience. Firstly, before you spend money on anything expensive, particularly if it’s a piece of technology, do your homework first. For instance if you do a Google search for “Nokia N97 review” it finds over 2 million hits. Read a few of them first and just as importantly, check the prices they quote. If someone in a second-rate store offers you the item for less than they pay in the USA, Europe of the Far East you know to be suspicious. Lastly, and perhaps most importantly, make sure you know exactly what you’re buying. Make sure you know that item you’ve selected is the real thing. Buying fakes is a reckless thing to do. There will be no warranty, no guarantee it will work, no rights to service from the real manufacturer. Yet more lies from the Bizz Awards people. Their claim that various important companies are "members" has already been shown to be untrue when it comes to Microsoft and PriceWaterhouseCoopers. We can confirm that Lufthansa is not aware of, does not participate and is not a member of the "Bizz Awards". 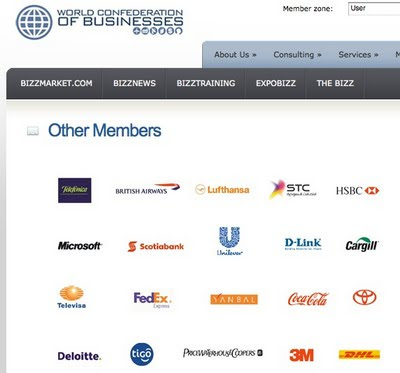 Is ANYONE actually a member of the "World Confederation of Businesses"? A news story in Mmegi on some action on standards at the Princess Marina Hospital? "The permanent secretary (PS) in the Ministry of Health, Newman Kahiya has given an ultimatum to Princess Marina Hospital staff to deliver or get sacked. "There is no question about it. If you don't deliver there is no reason for us to keep you," he told the staff yesterday." Too many things have happened in the last week. Too many to ignore so please forgive me for covering several of them. Firstly some good news. Correction. Some excellent news. So good in fact that I’m going to break one of my personal rules and use one of the words that I forbid myself from using. This event is (take a deep breath)… empowering. Yes we the people of Botswana now have entirely free, 24/7 online access to our laws. OUR laws. Go to www.laws.gov.bw and you can browse every law enacted up until 2008, download them onto your PC and read them at your leisure. If you have a fancy smartphone or a laptop that travels around with you the laws can go with you. We’ve been campaigning for the laws to be online for a few years and it’s truly wonderful that this has now happened. This is truly important. Normally there is a huge gap between people and the laws that govern them. There’s a perception that laws are for lawyers, judges and politicians. In fact at the launch of the new web site last week I suspect I was one of the few people who wasn’t a lawyer. I was surrounded by members of the legal profession, as well as judges, MPs and Ministers, even the Vice President was there to mark the occasion. But this misses the point. While these people were important, some very important, they aren’t actually the people that matter the most. I firmly believe that the laws of Botswana belong to you and me, not the bigwigs. Yes, politicians make the laws, judges enforce them and lawyers make a fortune from understanding them but it’s you and I that actually have the greatest interest in them. It is, after all, you or I that will end up in court if we break one of them. It’s also you and I that benefit from the protections these laws offer. That’s why I think it’s so important that we can see these laws, read them, understand them and know what they offer. That’s why we’ve been campaigning for them to be online for so long. So go to their web site, have a look and let the AG’s Chambers know what you think. At the moment it’s fairly simple and there are a few technical issues but the basic service is there. Take a look also at the Consumer Watchdog blog and I’ll post links to the laws I think are the first you should read. That’s the good news. Now for an update. A few weeks ago I wrote about the ridiculous “Bizz Awards”, a scam award scheme that gives your business a prize, so long as you pay them P25,000 first. Then you can go to their awards ceremony in Texas, once you’ve paid your air fares and hotel bills as well of course. You may remember that they didn’t like our comments but instead of threatening us they very generously tried to bribe me with a fully-paid trip to Texas and attendance at their awards ceremony. Sadly I decided that my principles were worth more than a free trip to cowboy country. Anyway, I was at their web site looking at the various companies that the Bizz Awards people CLAIM are “members” of their scheme. Companies like Microsoft, Price Waterhouse Coopers, Toyota, British Airways, Coca-Cola, Fedex and DHL. This seemed unbelievable. I couldn’t believe that respectable companies like these could have fallen for the Bizz Awards scam so I contacted them asking them to confirm it. So far I’ve heard back from Microsoft, Price Waterhouse Coopers and Coca-Cola. Each one said they have NOTHING to do with the Bizz Awards. I think we all knew this was a scam to begin with but isn’t it nice to have more evidence? Finally two celebrations of people from the same service provider. We heard from a reader suffering from some noisy neighbours who partied every night, kept the neighbourhood awake and generally made his life miserable. He called the Police several times but as soon as they’d visited, warned the noisy neighbours and left the party would start again. We alerted him to Section 176 of the Penal Code which outlaws being a “common nuisance”. He forwarded this advice to the Station Commander at the local Police Station and 3 hours later the cops were round at the noisy neighbour’s house, confiscated his sound system and now want a statement from our reader so they can press charges against the offender. There’s a lesson for you. Give the Police a hand doing their job and you’re more likely to get results. Evidence, unnecessary evidence of course, that there are Police Officers who are examples of everything we would expect from the emergency services. His name is Inspector Mojalemotho from Central Police Station in Gaborone. He is clearly a service star and tribute to the Police Service. We’ll be writing a letter of commendation to the Commissioner of Police commending him. If you know him, give him a pat on the back. Dr Atalliah Molokomme, the Attorney General and her team for publishing the laws online. Inspector Boiki Mojalemotho from Central Police Station for being a star. The team at Gaborone West Police Station for their action in silencing a noisy neighbour. I have a question about the rules a landlord can impose when I rent a house. I finally found a place in Tlokweng but the landlord told us there were several rules if we took the place. Rule No.1. Girls not allowed as our visitors. I thought this was difficult because I knew that our class mates would love to visit us for revision purposes. He also warned us about male visitors. Rule No.2. Cars not allowed in the yard. Rule No.3. Visitors not allowed to stay more than a week. This one is so heart aching because our younger brothers and sisters had to suffer as we did while starting their tertiary education though we thought we had accommodations, and they are suffering because of the so called rules and regulations for leasing a house. My concern is how these rules are set. Isn’t the law involved in this issue or can each citizen running this kind of business set his own laws in his yard? If not, how can we as citizens tackle this because these people are abusing and violating our rights as their tenants. I think you have to be reasonable here. When you sign a lease to rent a house, or even just a room in a house, both parties, the landlord and the tenant, must respect each other’s wishes and requirements. Nobody is forcing you to rent this property from this landlord, just as nobody is forcing the landlord to rent the property to you. What’s more, this is actually HIS house. He IS entitled to set the rules. Of course these rules can’t contravene the law but as long as he respects your legal rights he IS entitled to set rules. Yes, you might think his rules are silly, out-dated and impractical. I agree with you, I think they are too. But he IS entitled to set them. Remember that you have no right to rent this particular property, just as you have no right to buy a particular product from a store and no right to get a loan from a particular bank. The company or person providing the product or service can decide who they want to sell it to. The answer, of course, is to shop around. Most landlords will impose certain rules to do with your conduct while you’re a tenant but shop around until you find one that suits you best. If you don’t like his silly rules move on and find a more accommodating landlord. Some months ago I visited a web site that offered me a free astrological reading. I got an email from the site from someone called Sara Freder. She sent me a long email but at the end it wanted me to spend money to get the full report which I ignored. Since then I received many emails asking for money and warning me about both good and bad events in my life that only she can tell me about if I give her money. Do you think I should send her the money? Absolutely NOT. Please don’t even think of sending this crook a thing. Two reasons why. First, you do realise, don’t you, that astrology is hogwash? This is one of those ideas that needs to be consigned to history’s dustbin. There is simply no sense to astrology. Every time real scientific research has been done into the relationship between your birth date or your star-sign and your life events or personality it has shown there is simply nothing to it. It’s all rubbish. In the interests of research I did a little experiment. I went to the web site and completed the form asking for basic personal details twice, once as a man, once as a woman but both times giving the same date of birth. I gave two different email addresses and waited to see how similar the “readings” would be. When they arrived it was clear how this worked. The two readings were, on first glance, different but as I read them it became clear that they had been constructed from basically the same text, it was just the order that was different. Both emails talked in the vaguest possible terms about my future but the message was very simple. I get more when I pay for it. That’s all there is to this scam. The Frenchman just wants your money. Once you’ve paid you can be assured that there would be more and more emails sent your way, encouraging you to spend more money for more readings. I’ll make an astrological prediction for free. If you send this crook money for a reading, he will get richer and you’ll get poorer. Guaranteed. Still no legal action from the fraudulent, scamming, crooked “University of SouthCentral Los Angeles” who got all shirty and threatened us with legal action when we exposed their fake degrees business. Shame, I was so looking forward to a fight with a scammer! This is important and it’s wonderful. It’s taken a while but the laws of Botswana, OUR laws are now online for free, courtesy of the Attorney General’s Chambers. Go to www.laws.gov.bw and see for yourself. We’ve been campaigning for this for years and it’s brilliant that it’s now happened. Good for them! Some Botswana laws you should download, read, memorise and USE! More lies from the Bizz Awards? Yes, we now know that they lie when they say Microsoft are "members" but now it appears PriceWaterhouseCoopers know nothing about the World Confederation of Businesses either. Just how many of these so-called member are, in fact, members and how many are actually being exploited? I’m not a huge sports fan. Football is for girls. Rugby is for people who enjoy broken bones. Boxing is for people who get a kick out of brain damage. Athletics is for people who prefer steroids to beer. Golf is for people with enormous egos and no dress sense. Is there any sporting group I haven’t offended yet? Cricket, in fact, is the only sport that has ever appealed to me. It seems to be rather cultured, gentle and polite. I can go for any sport where you can sit in the shade on a hot day with an icy cold beer and nod off and you won’t miss very much. It’s also a sport where you see gentlemanly, responsible behaviour. OK, apart from some organised crime-related match-fixing. Apart from that cricket players and managers seem a fairly responsible bunch to me. Not always though. There was an example recently of an almost catastrophic failure of cricketing responsibility. I’m talking about the Fireworks Night celebration at the Cricket club a couple of weeks ago. That was a very good example of a complete lack of responsibility. Not one that just led to customer dissatisfaction, complaints and anger but one that could easily have killed people. As most people in Gaborone must know, every year during the weekend closest to November 5th there is a fireworks display at the Gaborone Cricket Club. Like many people I’ve been several times and despite a few minor issues it’s always been a good evening out. It’s at the weekend so the kids can come along, they’ll see their friends and leave their parents alone for an evening. Loads of people from every background are there, in general it’s a great occasion. Well, it was until this year. This year things were different. This year it all went horribly wrong. I don’t know what exactly caused it but a firework was released into the crowd. I was sitting directly behind a family whose clothes were hit by burning fragments. Luckily we had water to hand and that helped put out the fire. OK, perhaps you think this was one of those frightening but very rare occurrences? Perhaps, but it wasn’t so rare. Moments later the same thing happened again and then yet again. Fireworks were hurtling into the crowd in all directions and even into a neighbouring plot where they started a serious bush fire. Then, just to make things even worse, the idiotic organisers seemed to take the idiotic decision to turn off the idiotic lights, leaving an already frightened crowd in darkness. I really did feel that we were a moment away from mass panic. Given the tiny exit from the grounds there could very easily have been a massive crush and perhaps even deaths. By this stage my family and I thought it was time to leave and once the rush had settled down we were out of there. I only found out a couple of days later that shortly after we left the entire fiasco started over again but with perhaps even worse results. More fireworks hit the crowd, people’s clothes were set alight and some people were badly burned. Yet again it’s amazing nobody was seriously hurt or killed. If you want to see pictures of this chaos and you’re already a member of Facebook search for the “Gaborone Fireworks Complaints Forum” page and you’ll see evidence of the danger. On top of all this ineptitude with the fireworks was the level of crime present at the display. I’ve heard of at least two people who were mugged in the car park, despite the presence of guards from a particularly useless security company. One of the few uplifting moments apparently was when someone was caught in the club bar with pockets fill of stolen cellphones. Apparently a minor amount of immediate “citizen justice” was delivered to the possessor of all these phones. Of course I don’t approve of vigilantism but if someone has to be smacked in the face I’m happy if it’s a mugger. So what level of responsibility should the organisers of this public safety hazard take? Complete responsibility. The organisers from the Cricket Club need to take full responsibility for having absolutely no ambulance or first aid service available at the event. I’m told that they asked one of the private ambulance companies to be there but weren’t prepared to pay them for their time. Where were the effective security guards? No I don’t mean the inept ones in red “sting in their tail” uniforms mincing around like a bunch of nancy boys, I mean the real thing. They were nowhere to be seen when they were needed. Where were the fire marshals ready for an event like this to happen? Finally, where was the permit that the Cricket Club required for such a public gathering? I’ll tell you where it was. It didn’t exist. According to one person who attended who called the City Council, the Cricket Club’s application for a permit was denied. DENIED! Of course that means that any Public Liability Insurance they might have had for the event is void. I call that an utter lack of responsibility and criminal recklessness. The subsequent lack of any response from the Cricket Club is irresponsible and cowardly. Clearly the Cricket Club hasn’t got any (cricket) balls. Our advice to people who might consider going there next year is this. Don’t. Yet again, the Beekeeping Unit in the Ministry of Agriculture for being passionate, enthusiastic and obviously loving their jobs. Gadifele from FNB Kgale Branch for being “brilliant”. Terry and Ruth from Leskar in Fairgrounds in Gaborone for being extra-helpful. Botshamekelo from National Foods Technology Research Centre in Kanye for being so enthusiastic and welcoming. I do trust you help me on the one. I met this guy in town on Saturday and he introduced me to a marketing company by the name of WINALITE which he says is new in Botswana. This guy managed to convince me to join this company but I want to confirm from the ever scrutinising Watchdog if this is safe to deal with looking at the benefits that they say you get when using their products. I went into their website www.winalite.com but I fail to understand how a sanitary pad can do things like relieving stress, improving immunity, healing fibroids, increase of oxygen in the womb and lungs. Hope you will help me before I jump into any decision that I may end up regretting? This sounds very suspicious to me. How were you approached and what did the guy offer you? Was it a pyramid-style structure or something else? "The new anion-chip is proved to launch anions and far infra-red function by detection, hastens human microcirculation, inhibits reproduction of anaerobic bacteria, while hastens women`s partial micro-circulation, raise the growth of bio-enzyme and improve women`s self-protection ability." You don't need to be a gynaecologist to know that they're talking complete hogwash. I would steer way clear of this. It way too risky. I was in a restaurant and this gentleman came to sit next to me waiting to be served. He greeted me in a Zambian accent and we ended up having a chat during which he asked me what I am doing for a living. I told him I have a job and he asked if am satisfied with my earnings because he had something that could change my life instantly and which would enable me to quit my job. That’s when he showed me the Winalite product quide and business opportunity book. The joining fee is $90 which comes to P700. I understood this is a pyramid style business when he told me that the more people I recruit the more cash I make from the points i accumulate from the new recruit’s sales. He gave me his business (WINALITE) website and we were to meet after I have read the documents he gave me so he could explain further anything I haven't understood. I am not going to continue with this business. Immediately I received your email I called this man to tell him I have changed my mind because I confirmed with Consumer Watchdog if the business is safe and he promised to call me back. Thanks for your quick response and for your advice. Thanks very much. On 4th August I purchased a queen bed from Style for P3039.95. I paid a deposit of P760 and gave them 5 post-dated cheques to cover the payments from August to December. In mid-August I realised that the bed was not in a good condition, it was creaking and uneven. I called the owner of the shop to let him know about this. He promised he would replace it. By the end of September there was still no replacement and no communication from the shop. I then returned the bed and asked for my refund since they didn't have a replacement in the shop. When I returned the bed the owner’s wife told me that the owner is the only one who can do refunds. She also told me that he was in South Africa and that she was unsure when he will be back. I kept calling every week to check if he was back. On 30th October I called, he was in and I spoke to him. He was so rude to me, telling me that I have been harassing his wife and that I should stop doing that and all kinds of stories. He went on to say that he has not even inspected the bed. I have waited for this gentleman for over a month and what I get is him disrespecting me. Please assist me, all that I need is my refund. Where do some furniture stores get their owners and managers? Like so many of their products the owners themselves are simply not “fit for the purpose”. We called the owner and he told us a sob-story about how busy he was, how much he was travelling and he confirmed that he hadn’t had a chance to inspect the bed. More worryingly he told us that his trading licence had expired so he couldn’t go to the office at the moment. Of course that’s utter rubbish, of course he can go there, he just can’t trade. There’s nothing stopping him honouring his legal obligations to you. There’s nothing stopping him from giving you the refund you deserve. We’ve been trying to call ever since and now he’s not taking our calls either. Please let us know if you hear from him. Particularly if he comes up with any more excuses about why he can’t honour his legal obligations! We’ll keep hassling him as well. Our laws are now online "open to the public without any restriction". See the announcement here and the laws themselves here. Congratulations to the Attorney General's Chambers for giving the people of Botswana their laws! The Bizz Awards - More lies? "I sent you information, there was a list of member companies of last years. I think the information was transparent, but why can´t you just contact them"
I followed your suggestion and I contacted just one of the companies who featured in your list. The list included: "MICROSOFT DE GUATEMALA, S.A. Guatemala" and "MICROSOFT LATIN AMERICA". I received an email from Microsoft Latin America's PR Manager this morning which stated: "I can confirm that Microsoft Latin America is not a “member” nor support this organization in any way." Franck, is this yet another "mistake" or is it in fact just a lie? I’ve never been to Texas. Given the events of this week it’s perhaps best if I cancel any ideas I ever had about visiting the place. I might not be welcome. I don’t mean that all of Texas is out to get me. Despite having said an enormous number of rude things about George W Bush over the years I don’t think I feature on his hit list. I also sometimes use the word “cowboy” as an insult but again I don’t think that really causes too much disruption. It’s just a small number of Texans that I’ve irritated recently. In fact, I should correct myself. I’m not actually sure they were Texans at all, I think South America might be the place for me to avoid at the moment. This all relates to the “Bizz Awards", a fake prize scheme that we’ve been covering for the last few weeks. This bizarre award scheme seems to work in a rather back-to-front manner. Instead of recognising a real, tangible, measurable achievement, the Bizz Awards are awarded to people who are approached entirely at random and who then cough up $3,530 to “join”. I know this is true because the owners of the Bizz Awards, the grandly titled “World Confederation of Businesses”, have approached three different companies in Botswana alone congratulating them on winning an award. No initial research, no discreet enquiries, just an email from a total stranger that says they’ve won the award. I also know this because elsewhere in the world companies that have never actually traded have been contacted in the same way as well as companies that are dormant. Better still, totally non-existent companies have been selected, including one that I set up myself. That’s right, my totally fictitious company that was nothing more than a free email address was invited to buy one of their silly awards. Let’s face a basic fact. No genuine award requires the winner to pay for it. Nobel Prizes, Olympic medals and even the occasional Consumer Watchdog awards are awarded entirely for free. Anyway, those of you who’ve read this column recently will ask why I’m reporting on it again. Because they phoned me. The World Confederation of Businesses called me last week, all the way from Texas. Their representative, Franck, was very upset that I appear to have exposed their scheme. Apparently we’ve caused him a lot of trouble and he was keen to explain how legitimate they are but his arguments weren’t very persuasive. One of his best was that they wouldn’t still be in business if they were crooked, would they? I couldn’t help think that it works for the Mafia, Nigerian scammers and various foreign Governments I won’t name. But then the call got better. My new friend Franck made me a fascinating offer. He said that if I remove all references to the Bizz Awards from our web site and from the Consumer Watchdog blog and if I promise not to publish anything more about them they will fly me, entirely at their expense, all the way from Botswana to Texas, they’ll put me up in a hotel for a few days, they’ll invite me to attend the prize ceremony and they’ll generally show me a very good time. All for free. I haven’t done the maths but I suspect that this would cost them at least P30,000 once they’ve included everything. Now of course I have to make this clear. They’re not offering me cash, it’s just an expenses-paid trip, but I think you’ll agree this is quite a generous offer. However, I think you’ll agree that if I accepted anything from these people I would be a shameless, loathsome hypocrite, particularly shameless and loathsome if I retracted all the bad things I said about them in order to get this obvious bribe. There’s also the issue of how this offer would be portrayed by the Bizz Awards people once I had accepted it. I know for sure that there would be photos of me there at the ceremony with captions illustrating how I had accepted their hospitality, how Consumer Watchdog from Botswana endorsed their fake awards scheme and no doubt pictures showing me with a stiff drink in one hand and a loose woman in the other. How could I then continue to criticise them? You might wonder, like I did, why these people were feeling so generous? Why would they want to stifle criticism from a little consumer rights advocacy group in a country a long way away? Why are they so afraid of what we’re saying? Try this little test to find out. Go to Google and search for “Bizz Awards” and you’ll see why I think they are so desperate to shut us up. That’s why they are trying to silence us. Anyone with a brain who receives one of their emails from the blue announcing that they have won an award is likely to go to Google before doing anything else. Three of the top ten hits are skeptical of the Bizz Awards and your friendly neighbourhood Consumer Watchdog is top of that list. That’s why they need to silence us. I have, of course, politely rejected their bribe but I wonder what will come next? Threats? Mmegi readers will be the first to hear. Keneilwe at Pick N Pay at Molapo Crossing for “exceptionally good service”. Naledi at FNB Kgale Branch for consistently good service, knowing her customer and always being helpful. The entire car loan team at Bank Gaborone for quick, pleasant service. I bought a laptop from [Store X] on the 29 October 2009 and the last time I used it was Saturday. This morning when I switched it on I noticed a crack on the screen and took it to them and they are saying their company doesn't cover physical damages but it is not clearly specified on the invoice. Right now they are saying they are sending it to South Africa to check if the crack on the screen is a factory fault or my fault but if the report doesn't show its a factory fault I will have to cover the cost repairs. This all depends on how that crack got there. Let’s take the store’s side for a moment. If you mistreated your brand new laptop and caused the crack then obviously it should be your responsibility to pay for fixing it. Although laptops are designed to be compact and portable they aren’t indestructible and they do have to be treated with great care. Our free tip for the week is not to forget to buy yourself a good-quality carry case for a laptop. Spending a bit extra for one that is designed for exactly the size and shape of your laptop will be money well-spent. Also, don’t make the mistake I once made of buying a rucksack-style laptop case that didn’t entirely cover the laptop. It was a real risk being outside in the rain. Get one that fits your laptop snugly and protects it against everything nature is likely to throw at it. The interesting question is what motivation is there for the South Africans to say that it’s their fault? Surely it’s in their interest to say that it’s your fault? That way they don’t have to pay for the repair themselves. Was there any other damage to the screen? If you had dropped or mistreated the laptop wouldn’t there be other damage as well to the casing surrounding the screen? The warranty that you got at the bottom of your invoice is curious. The way it’s phrased is difficult to understand but it almost says that there is no warranty on physical damages but it doesn’t actually say it clearly enough. Also the major flaw in the warranty is that you haven’t actually “specifically consented” to each exclusion. If they insist on applying each of those terms it will be, according to Section 17 (1) (f) of the Consumer Protection Regulations, both a “deceptive practice” and an “unfair business practice”. We look forward to hearing what their investigation says. Let us know and we can take it from there. Last week we published a story about a consumer who paid a P400 deposit for a bedroom suite from Carnival. It later transpired that the suite wasn’t in stock so the customer exercised her right to cancel the order. That’s when things allegedly went wrong and she had trouble getting her deposit back. However the good news is that at the last minute before submitting the article we heard that her deposit had been returned to her so she was happy again. However we later received an email from someone at Carnival who didn’t identify him or herself. Just so you all know that there can be two sides to a story, this is what the email said. I’ve not changed anything in the email except to remove the name of the customer. I’ve also not changed the spelling, the grammar or the punctuation. You can’t tell us that we’ve got a story wrong but not explain how it was wrong. Please give us some details and we’ll be happy to put it right. We have no idea who you are. I’m very sorry about the phone problems. We did indeed have a problem on the day you emailed us but the lines were working again very quickly. Finally, please have a look at your computer keyboard. Towards the bottom right corner you’ll find a key with a full stop on it. Is yours broken? Anyway, we thought this problem was fixed? We had already spoken to the Managing Director of Carnival before you sent your email. He was very helpful and he ensured that the problem was sorted out. Anyway if you have a correction to our story please give us the details and we’ll be happy to publish it.